They’re some of the most widely derided men and women in the country; criticised for their expenses, mocked for their policies and attacked for their beliefs. But are Members of Parliament (MPs) being treated fairly by the public? The job means regular trips across the country, from constituency engagements to evening votes in the House of Commons. Some degree of absence from family life is an inevitable aspect of the role. On top of this, party leaders and their MPs often face a barrage of criticism online and struggle to keep up with the expectations of their constituents. This report has been designed to explore current voter attitudes to their elected representatives, examining some of the most interesting aspects of the job and gauging whether the public think the role and its responsibilities should change. We’ll examine the pay and perks given to MPs as well as how they operate, and whether technology should play a greater role in helping them fulfil their duties. Above all, using independent polling and analysis, we’ll draw some conclusions about how the role of an MP needs to change to meet the increasingly high expectations of the public. Perkbox commissioned independent polling company Censuswide to survey 2,000 members of the UK public from across the country. The poll was conducted in April 2018 and examined attitudes to the role of MPs, exploring everything from pay and perks to working conditions and public perceptions of the main party leaders. Leading a political party is arguably the toughest job in politics. If attacks aren’t coming from the media and opposition, they’ll be coming from within. Whether it’s navigating the complex Brexit negotiations, trying to prevent a political coup or attempting to develop eye-catching policies, stress comes from all angles. 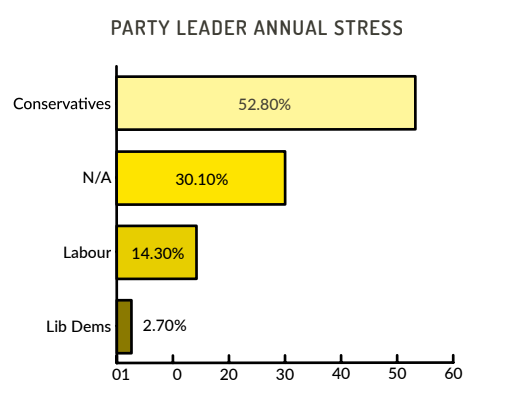 We asked voters which of the three main party leaders they felt had endured the most stressful year so far. Prime Minister Theresa May of the Conservative Party topped the ballot at 53%, compared with the Labour Party leader Jeremy Corbyn’s 14%. It appears that voters think Liberal Democrat Party leader Vince Cable is having an easy ride, with only 3% saying he’d had the most stressful year. The remaining 30% said that, in their opinion, none of the leaders had a stressful year. Working in politics requires a thick skin – especially where internal conflict is concerned. We asked voters which leader they felt had been treated the worst by their own party colleagues. Nearly a third (32%) said Jeremy Corbyn, who has faced serious criticism and divisions within his own party. This was followed by Theresa May on 26% with Vince Cable on 3%. The remaining 38% said none of the leaders had been treated badly. The work ethic of MPs is a debated topic. We discovered that over a third (33%) of voters felt their local MP’s work ethic was either strong or very strong, while 28% believed it to be either poor or very poor. Some 21% said they didn’t know, while 18% admitted to not knowing their local MP. Currently the basic annual salary of an MP is £77,379. 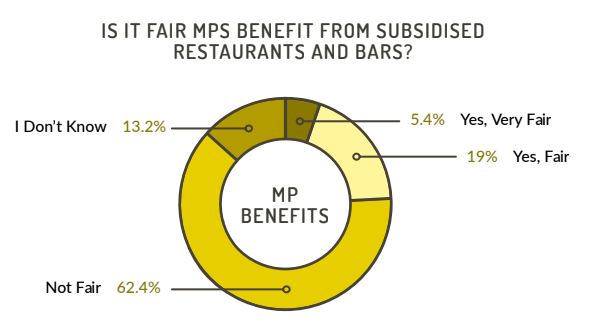 We asked voters whether MPs should be paid more or less for fulfilling their duties. Some 64% of the public said a paycut is in order, 29% said their pay should remain the same, while 7% said MP’s deserve more. One of the biggest perks available to MPs is heavily subsidised restaurants and bars within the Houses of Parliament. Reports have estimated the bill for such benefits reached up to £2.7m last year – an increase of £200,000. We asked voters if they felt this arrangement was fair. Some 62% disagreed it was fair, 19% said it was fair, and 5% said it was very fair. We also asked the public what perks they would consider offering their own local MP. Six in 10 said they would not offer their MP any perks at all. Amusingly 10% said they would send their MP on an online ethics course and 7% said they would give them a gym membership. Some 5% suggested yoga classes, and an appreciative 5% said they would offer a massage, spa and sauna day. There is much debate in the media around how technology is changing the way people live and work. With the introduction of initiatives like flexible and remote working schemes and unlimited holiday allowance, is it time for our elected representatives to make better use of technology to support constituents? We asked respondents whether MPs who have to travel many miles to vote in the House of Commons should be given the opportunity to vote remotely. Some 41% said MPs should be able to vote via social media sites and specialised apps. Almost one in five (19%) agreed, but with limitations. Only 28% said no. One of the key responsibilities of MPs is attending ‘surgery’ meetings with constituents. This is an opportunity to listen to their views and concerns and take action to support them. We asked whether voters would ever be happy with ‘digital surgeries’ where MPs could use video services like Skype online to engage with their constituents. Interestingly, voters were broadly happy with this approach, with over half (52%) supporting it. Some 45% said ‘yes, sometimes’ and a further 7% said ‘yes, all the time’. Just 27% said flat-out ‘no’. This indicates that MPs could consider making better use of digital technologies to engage with constituents and conduct casework online. Our research has established that 2018 has, so far, been a turbulent year for the political class. A clear majority of voters believe Theresa May has had a much more stressful year than Jeremy Corbyn. However, the majority believe that Jeremy Corbyn has been treated far worse by his own party. We have revealed that the public is still highly critical of MPs’ pay, with the majority believing they should be paid less than their current salary. A tiny minority think they should be paid more. We’ve also learned that many people considered subsidised dining and drinking facilities in Parliament an ‘unfair’ perk, instead opting for an ethics course, or no perks at all. In spite of these statistics, around a third of people feel their MP has a reasonably strong work ethic. Looking to the future, it’s clear that technology has a role to play in our democracy. A clear majority of voters feel that it’s acceptable for MPs to use social media sites and specialised apps to vote. 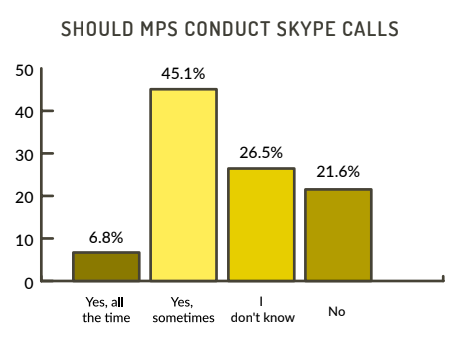 Likewise, many agree that using video services such as Skype is acceptable to ensure MPs are engaging with their constituents. 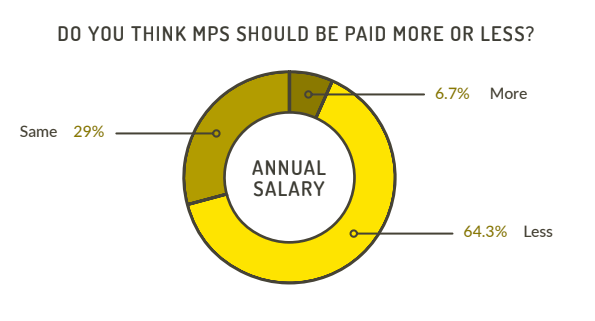 Overall, the public want MPs to have lower pay and less perks. They do however have a favourable view of their work ethic and believe they should make better use of technology to fulfil their responsibilities to the public.